Mobile developers will put more energy into monetizing and measuring their apps in the upcoming year, according to survey data from Urban Airship, a mobile services platform provider. The Android platform will continue to gain market share, Apple iOS and Android will be the dominant mobile platforms, and BlackBerry and Windows Phone 7 will see notable increases in app development. "If the app isn’t being used, if the user is not engaging with your mobile brand in a meaningful way, if the app has no real connection to your business, then it’s hard to validate it as a success," says Scott Kveton, CEO of Urban Airship. Mobile developers will put more energy into monetizing and measuring their apps in the upcoming year, according to survey data from Urban Airship, a mobile services platform provider. The Android platform will continue to gain market share, Apple iOS and Android will be the dominant mobile platforms, and BlackBerry and Windows Phone 7 will see notable increases in app development. These findings are detailed in Urban Airship’s 1st Annual Mobile Application Development Survey, released today and available for download on the company website. Mobile app revenue will become increasingly meaningful in 2011 and in-app purchase will be a top strategy for app monetization. App management and analytics will be increasingly critical. As developers seek to measure success for their apps, analytics and push notification management top their list of needs. iOS and Android development continues to dominate in terms of developer support in 2011, but BlackBerry and Windows Phone 7 will see notable growth. Three hundred and eighteen mobile application developers completed the survey; roughly half of them use the Urban Airship mobile platform currently. The majority of respondents use Urban Airship’s platform mainly for mobile messaging—sending push notifications to users via the app. The importance of revenue to app developers is growing dramatically. Of developers surveyed, only 13% of developers plan to develop a non-revenue–generating app in 2011, compared with 33% who did so in 2010. Non-revenue–generating apps could exist to support an overall branding campaign for companies or could be developed to provide a brand with a presence in mobile. “Clearly, as apps become more mainstream, companies are starting to realize their value as a content-delivery mechanism,” says Scott Kveton, CEO of Urban Airship. “In 2011, mobile is going to be another profit-generating channel for companies and we are seeing them updating their apps to enable monetization.” The most common revenues from apps come from the app’s purchase price, through in-app advertising, or via in-app purchase, which allows end users to purchase additional content and/or features from within the app itself. In-app purchase is quickly becoming the preferred method for increasing revenue in 2011. In 2010, the majority of app developers (47%) named initial download as their main source of revenue, with in-app purchase used by only 8%. In 2011, in-app purchase implementations will jump to 31%, a significant increase that points to the evolution of the mobile app and the strategies behind them. Although the majority of respondents (64%) say they measure mobile app success primarily by the number of downloads, a significant number of them are also considering other success measurements. A full 60% of respondents indicated that app usage is a key metric, as are revenue from the app (44%) and app store ranking (34%). 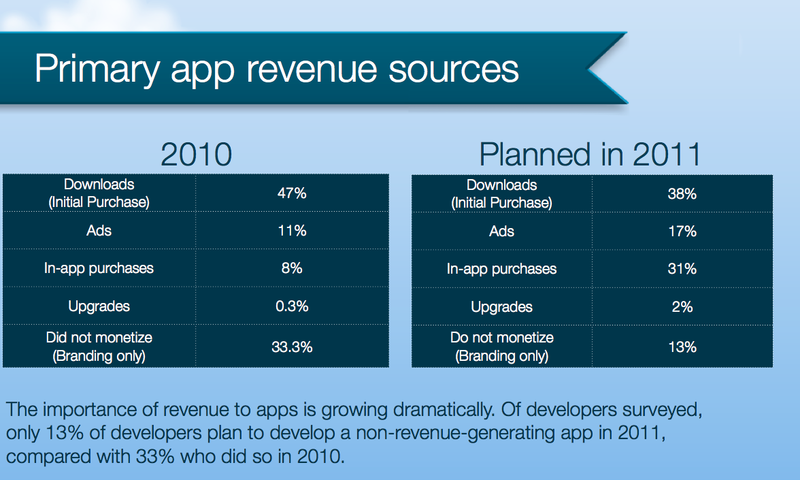 In 2011, fewer developers will measure app success solely by the number of downloads. For many, the real driver of success is what happens with the app after it has been downloaded to a user’s device. Respondents indicated that iOS and Android would continue to dominate their plans for mobile app support in 2011. Ninety percent of respondents indicated they will be developing for iOS and 74% will be developing for Android in 2011. Despite significant growth in developer support for Blackberry and Windows Phone7 in 2011, these platforms lag significantly behind iOS and Android, with 24% support for WP7 and 22% for Blackberry. Survey results indicate that developers believe they need to support both iOS and Android to attain wide success and will be evaluating their return on investment in supporting a third or fourth platform. Urban Airship powers the world’s most successful mobile apps. Providing breakthrough technology, Urban Airship makes mobile marketing far more engaging, effective, and efficient. Top brands depend on Urban Airship to ensure their mobile app initiatives are scalable and profitable. Verizon, Dictionary.com, Tapulous, and Warner Bros. are just a few of the thousands of companies that utilize Urban Airship's innovative platform to reach and engage target audiences - and increase app revenue streams. Urban Airship puts the power of influence in marketers' hands through push notification, rich messaging, and in-app purchases. The privately held company is based in Portland, Oregon. For more information, interested parties can visit urbanairship.com.